The GST Council's decision will only benefit buyers who are on construction-linked payment schemes. The Modi government on Sunday announced a cut in the goods and services tax charged on sales of residential properties under construction as it looks to stimulate the economy by driving up consumption. The Goods and Services Tax Council, comprising central and state finance ministers, announced that the new rate will be 5 percent, down from 12 percent, on all new housing projects except those that are classified as af fordable housing. The council also decided to slash the tax rate on affordable housing projects to 1 percent from 8 percent.However, builders will not be able to claim input tax credit (ITC) under the new GST rates. The new rates will be applicable from April 1. Properties, where the construction has been completed, attract stamp duty, not GST. Hence, ready properties that have received the occupancy certificate (OC) do not attract GST. The GST Council’s decision will benefit buyers who are currently on construction-linked payment schemes. Data from property consulting form shows there are 5.88 lakh under-construction homes lying unsold in India's top 7 cities. Of these, 34% are priced below Rs 40 lakh alone. With affordable housing now being defined within Rs 45 lakh budget, more properties qualify for this ‘sweet spot category. The GST cut, coupled with this critical change in definition, will induce more sales in homes falling in this budget range. Demand for residential properties is expected to receive a boost as the lower tax burden on home buyers will push up demand in the segment which, in turn, will keep developers committed to build more affordable homes. Brokerage firm Knight Frank maintains the reduction in GST can potentially reduce the buyers’ payout by 4-6 percent on the overall purchase, depending on the category. The consequent accelerating sales could bring down the unsold inventory, which has been on the rise for several quarters now. "The move will give the necessary fillip to demand in the under-construction segment, which has been suffering from low sales for the last many quarters. The elimination of input credit tax benefit may hit profitability on the supply side. But the potential demand generation will far outweigh negative aspects, leading to greater sales numbers and revenues," he added. "Another booster shot by the government is new definition of the budget-range of affordable housing. Extending the definition to houses priced within Rs 45 lakh is credible. It will bring more premium properties into the affordable segment, thus benefit buyers in cities like the Mumbai Metropolitan Region (MMR) where prices are exorbitant,"said Anuj Puri, Chairman, ANAROCK Property Consultants. "Rather than a GST rate cut, uniform taxation of under-construction and RTM homes, would really help. A GST rate cut would compel a few more fence-sitting buyers to take the plunge, but it will not serve the purpose of making under-construction properties as attractive as RTM properties,"said Anuj Puri. 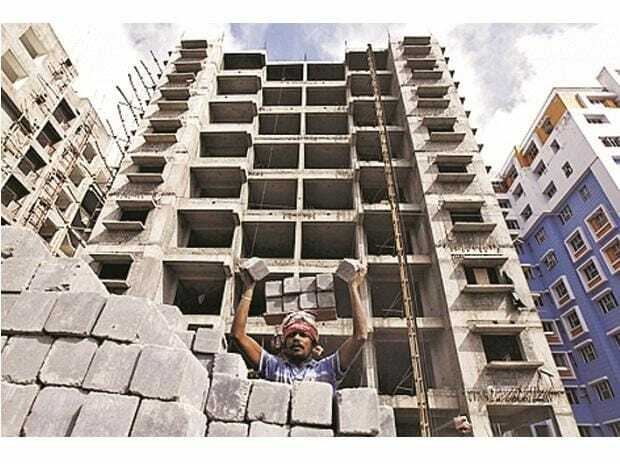 The GST cut will help the recovery of sales in under construction flats and the improvement in sales will eventually help builders reduce their financing cost which has escalated manifold since demand moved to ready-to-move-in units, said Pankaj Kapoor, MD at real estate firm Liases Foras. "For an economically prudent residential project, 60-65% of the project cost should be financed from the customers’ advances coming from sales of units in under construction stage. Selling projects inthe ready stage employ more capital and create a vicious cycle of slow down. The affordable segment contributes 53 percent of demand in terms of units sold annually across 60 cities in India, but in terms of valu,e it contributes 22 percent. I think the government should have kept input tax credit (ITC) at least for normal category of housing that attracts 5 percent GST, not just for the fact that it would have helped the developer to reduce the cost of construction, but more importantly it was making employment of black money in the real estate difficult. Now in the absence of ITC, the trail of invoicing will not be available. I am wondering it has again opened up the scope of black money employment in the sector," he said.